The Draft-N standard for wireless-LAN has yet to be ratified and it is unlikely to be so before 2008. However, the second draft hasn't been altered in almost six months, prompting manufacturers to release products. In looks, the Trendnet Draft-N Router TEW-631BRP (£92 inc. VAT) is very much a standard router, with four LAN ports and a connection for your broadband to be plugged into. There is a physical hardware switch that allows you to turn the wireless aspect off if necessary, which is a curious inclusion considering the aim of the device. This isn't a MiMo device, but it has three antenna, which increase the single strength of the unit, so you can still get a signal at greater distances. When it came to testing, you have to remember that 300Mbps is a theoretical maximum and, as we've seen with previous wireless LAN, is never really possible, with even half the maximum speed being the best possible throughput. So it was with the TEW-631BRP, as at close distance (15 metres) we managed a steady speed of 76Mbps, dropping down to 54Mbps at a distance of close to 50 metres. Security is always an issue with wireless networks, so you can choose between WEP, WPA, and WPA2 password-protection. It also supports MAC address filtering, SPI and NAT firewalls, and a DMZ host. Naturally, you'll need an adapter plugged into your laptop to use with the router. It's always best to use the same brand, especially for pre-ratified products, as this helps with compatibility problems. 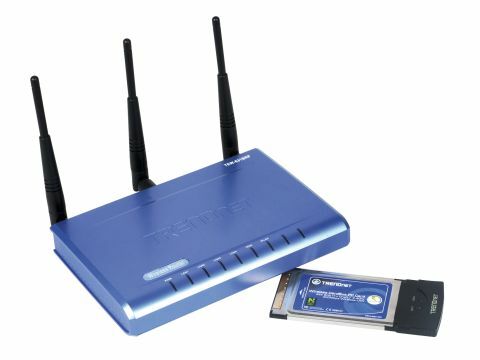 The Trendnet N-Draft Wireless Router DRAFT- N PC Card is a standard Type II card that comes with its own drivers. If you're setting up a wireless network in your home for a limited number of machines, opting for an un-ratified technology isn't a problem and the TEW- 631BRP is as good, if not better, than most. We're just not convinced the technology truly lives up to its claims.